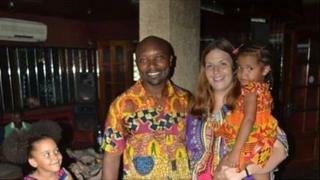 A man from Cameroon has been denied a visa to attend his baby son's funeral in the UK, after an arrest nine years ago for travelling with false papers. Katy Kouasseu, formerly of Aldridge, West Midlands, said it was her husband's right as a parent to attend the funeral of their son George. Hundreds of people have signed a petition to support the case of Charly Kouasseu, who never met his son. The Home Office said the ban had been issued "automatically". Mr Kouasseu was deported from the UK after serving 14 months in prison in 2008, it confirmed, with deportation orders not normally revoked until after a minimum of 10 years for non-serious offences. Mrs Kouasseu, who married and started a family with her husband while working as an English teacher in Cameroon, came back to the UK in August to give birth to her son. He died an hour after being born on 16 October. The cause of George's death is not yet known and the family are awaiting the results of a post-mortem test. Mrs Kouasseu, who married Charly in 2010 and has two other children with him, plans to bury George on Friday in Worcester. "We're not asking for Charly to be able to stay for a week. We just want him to come for George's funeral," she said. "He's never met George. He's never had that opportunity. We speak on the phone, but it's not the same. For him as a father; he should be there for his son's funeral." Mrs Kouasseu said she had decided to give birth in the UK to be near her family and had had a miscarriage in Cameroon. "I think this is a case needing compassion, which the Home Office seems to lack," she said. "I am incredibly sad, but not surprised." A Home Office spokesman said deportation orders were "put in place for the protection of the British public", adding anyone subject to an order has to apply to the department for it to be removed.